I‘m excited that I finally got my laundry drying racks installed in my house. It was just in time because the cold weather arrived this last weekend. They will be put to a lot of use this winter. I have experienced hanging clothes outside in freezing temperatures. I know what it is like to see stiff frozen clothes and diapers swinging from the line. They dried eventually, usually in about 3 days, as the sun evaporates the water from the frozen fabric. It can be done, but….it is not ideal! Hanging clothes inside during the winter is so much easier, especially next to a wood burning stove. They dry quickly, as well as put needed moisture into the dry inside air. I have a smaller home which is less than 1000 square feet, without a basement. I do not have a room that I can dedicate to hanging laundry inside. I especially don’t want to have clothesline strung throughout the house! I decided that I needed something functional (holding a lot of clothes) and aesthetically pleasing, as well as something that can be out of the way when not in use. Re-purposing a baby crib fit all those needs. Plus, I already had one! My toddler moved into a big boy bed and the next day I used it for my laundry racks. I have seen so many versions of crib drying racks online. Most are made to be used for cloth diapers and an occasional clothing item that needs to be line dried. But I have a LOT of laundry. 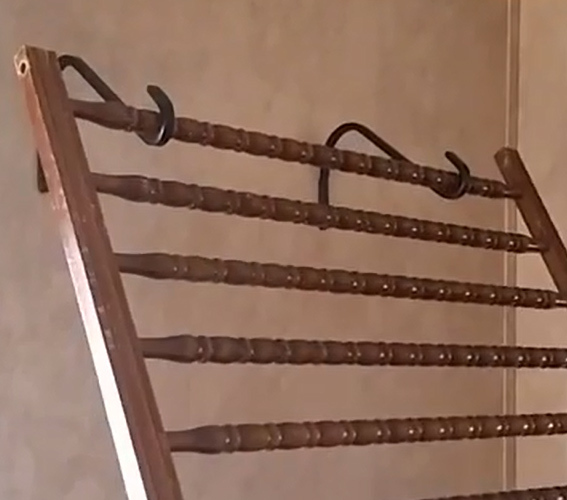 I really wasn’t sure how much my drying racks would hold until they were installed, but I was pleasantly surprised. They held enough for my family of four, so that I can continue to only do laundry 2 or 3 times a week. I will continue to hang towels and sheets outside on the warmest days. If they take 2 or 3 days to dry, that is fine with me. But the rest of our clothing, I can hang inside. 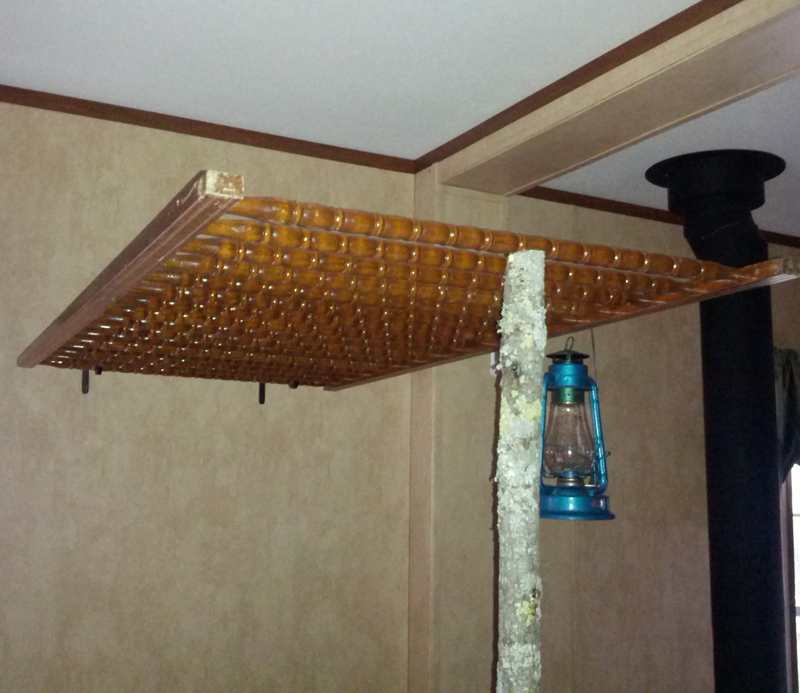 For my wall rack next to the wood stove, I used the side of the crib. We hung it from plant hooks screwed into studs in the wall. 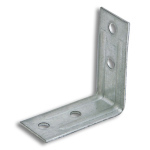 It was important to find the studs because the rack will be heavy when it’s full. Once the hooks were installed, I suspended the rack from the hooks. 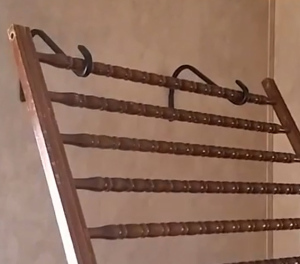 The online tutorials that I have seen, use a stick to push the rack out from the wall so that it is at an angle. I tried this, but all the clothes were bunched together. I prefer to have the rack completely horizontal so that as much as air as possible moves between the clothes. A post that my husband cut from a persimmon tree in our yard worked great! I could have doubled my space by using both sides of the crib, but I just don’t have the wall space. This rack will be primarily used for socks and smaller items like my toddler’s clothing. The rack in my bathroom will be used for shirts, pants, sweaters, etc. I used the wire frame used to support the crib mattress and hung it above the bathtub. It fit perfectly in the space and I don’t need to clean up a wet floor as clothing drips dry. For this project we used 4 L brackets screwed into the studs. We set the frame on top of the brackets and tied it down securely with wire. I put the clothes on hangers (with clothespins to secure them) and hung the hangers from the frame. I packed my clothes onto the wire grid pretty tightly. They would have definitely dried faster if I had less clothing so more air could move around them. But this is what I had for laundry that day. I wasn’t too worried about it. As it was, they dried enough that I could move them that evening before we used the shower. They were still damp, but dry enough that I could hang them from the extra space in the closet without being concerned with dripping. All of the clothing was dry by the next morning. 24 hours inside, as opposed to 2 to 3 days outside! I call that a victory! Plus I don’t have to stand outside with freezing fingers hanging clothes for 20 minutes! As the winter gets here and we begin to use our wood stove most of the day, I believe that the clothes will dry even faster as the air gets dryer in the house. 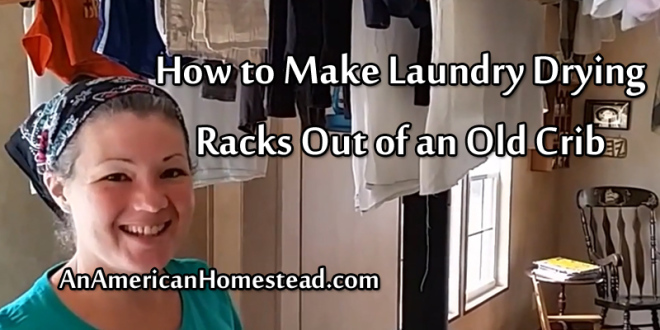 To see my drying racks in action, view the video below on our YouTube channel. 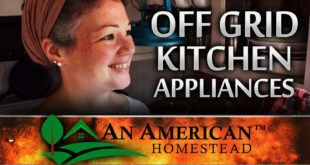 Subscribe to An American Homestead to be notified of more fun homestead videos about our off grid adventures! I also used the side of my old crib for hanging laundry. 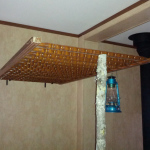 I hung it from hooks that I had screwed into the beams in the basement ceiling. 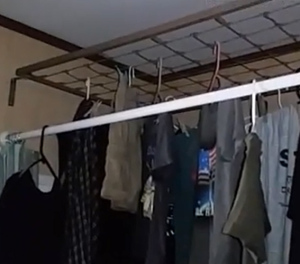 Instead of hanging the items on the wooden rails, I hung shirts on hangers and then hung the hangers on the rails. It held quite a few shirts in a small space. You could hang tea towels and washcloths on hangers as well. I also hang socks in pairs from the hangers using clothespins – 3 pairs per hanger. Thanks for the tips Mary! I’m using hangers on mine also with shirts, pants, and towels. 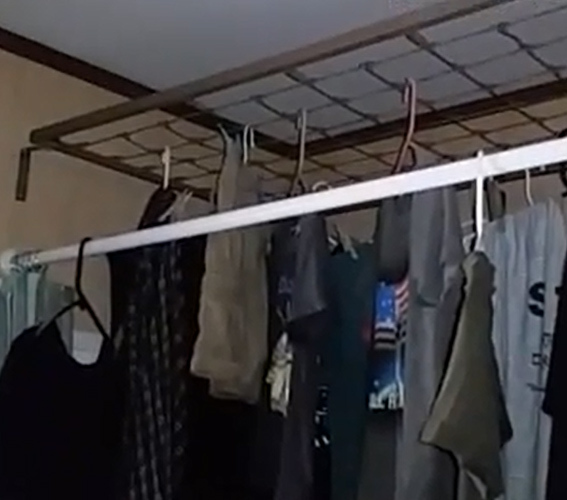 If I have clothes that are still dripping, I use my bathtub drying rack and then move them to my other rack next to the stove when they are not dripping. Clothespins on hangers work very well! I just need more hangers! I love this. My babies are teen-agers, but I see cribs at thrift stores and yard sales all the time. I have one room that is the laundry/pantry/utility room. I would love to rig one up using a pully (I’m short) so it could be raised and lowered. You’ve gotten my wheels turning now – thank you. We are a family of 9 and I would love to move out family out of this environment. We’re wondering if you knew anyone that is doing this same living with so many kids. I want to know how they got started.